This new Electronic Briefing Book on Operation Intercept -- the Nixon government's unilateral attempt in 1969 to halt the flow of drugs from Mexico into the United States -- is the second to appear based on a collaboration between Proceso magazine and the National Security Archive and launched on March 2, 2003. The collaboration grew out of a shared desire to publish and disseminate to a wide audience newly-declassified documents about the United States and Mexico. Each month, Proceso magazine will publish an article by the Archive's Mexico Project director, Kate Doyle, examining new documentary evidence on a chosen topic. The series - called Archivos Abiertos (or, Open Archive), will draw from U.S. and Mexican declassified records on a range of issues that could include, for example: drug trafficking and counternarcotics policy, Mexican presidential elections, human rights cases, immigration, U.S. training of the Mexican military, NAFTA negotiations, the role of the press, peso devaluations, and state repression during Mexico's "dirty war." On the same day that Proceso's article appears in Mexico, the National Security Archive will post an Electronic Briefing Book on its web site, containing an English-language version of the article, a link to Proceso's web site, and all of the declassified documents used for the piece, reproduced in their entirety. In the weeks before the Bush administration launched the war in Iraq, the Mexican press was brimming with speculation about the punishment the United States might inflict if the Fox government did not vote with the U.S. in the United Nations. That vote never came. There are, of course, historical reasons for such anxiety. Mexico has been the target of U.S. reprisal in the past, during disputes over issues such as migration and the narcotics trade. American presidents have used the border, in particular, as a bargaining chip, holding it hostage during tricky or troublesome negotiations when the United States was determined to get its way. A look back at one of those episodes - Operation Intercept - highlights a stark truth about US-Mexico relations in the 21st century. The size and economic significance of the trade flowing between the two countries today makes unilateral, punishing action by the United States against its neighbor impossible to sustain. The border no longer belongs only to the United States; it is a shared wall. That is a dramatic change, and should give Mexico a new sense of partnership with the United States. It began on the border between Mexico and the United States. The year was 1969. In Washington, a new president occupied the White House - the first Republican in eight years - determined to prove he could establish law and order in a nation that seemed to be spinning out of control. Richard M. Nixon had campaigned on the promise that he would wage a relentless fight against the narcotics trade. He chose Mexico as his first battleground. At the time, U.S. concerns were focused not only on rising drug use at home but also among American soldiers in Vietnam. With drug treatment programs in their infancy, Washington turned its attention abroad - on the countries that produced, processed and exported narcotics. Mexico wasn't the only target, but it was the first. As senior administration officials began to plot an assault on the flow of marihuana from its neighbor, they also prepared plans to attack the heroin trade in Turkey, where most of the world's opium was grown, and France, where organized crime rings smuggled the processed heroin into the United States. The plan led eventually to the destruction of the infamous French Connection. The idea for a "war on drugs" grew out of a campaign pledge Nixon made in September 1968 in Anaheim, California. Anaheim, in the state's Orange County, was then - and remains today - a spawning ground for grassroots political conservatism. This was the home of Nixon's "silent majority," his deep political base among white, middle-class Americans who feared the political and social changes that were roiling U.S. society in the late 1960s. Before an audience of white-collar workers and suburban housewives, the Republican candidate promised that, if elected, he would "move against the source of drugs." Two months after Nixon took office, he established the Special Presidential Task Force Relating to Narcotics, Marihuana and Dangerous Drugs, placing his hard-line attorney general, John Mitchell, and Secretary of the Treasury David Kennedy in charge. The narcotics task force based its work on the premise that one of the most serious challenges facing the United States was drug abuse. With representatives from ten different federal agencies, the group spent eight weeks assessing the dangers of marihuana, the flow of drugs over the Mexican border, and strategies to control drug smuggling and marihuana cultivation. When its report was released on June 6, it singled out Mexico as the primary supplier of marihuana and a source for a large amount of other dangerous drugs, including heroin. According to the task force, Mexican free-lance smugglers and organized traffickers were "largely responsible for the marihuana and drug abuse problem" that Nixon and his supporters so vehemently deplored. a concerted frontal attack on the illegal importation into and subsequent illegal sale and use of marihuana, narcotics and dangerous drugs in the United States." In practical terms this meant a crack down on the border with Mexico, with or without Mexican cooperation. As senior presidential aide John Erhlichman told Nixon in a memorandum on June 18, the task force recommended that the Mexican government "be forced into a program of defoliation of the marihuana plants." The weapon used to bludgeon Mexico into compliance would be a massive surprise attack on Mexico's border by U.S. law enforcement personnel, code named "Operation Intercept." Intercept was plotted in secret to produce an unprecedented slow-down of all plane, truck, car and foot traffic - legitimate or not - flowing from Mexico into the southern United States. In order to achieve their goals, the president's top enforcement advisors deployed thousands of extra Border, Customs and Immigration agents along the 2,000 mile line that separates the countries, from just north of Tijuana to Brownsville, Texas. Once in place, the agents were charged with stopping and inspecting anything that moved. Where traditionally U.S. officials would wave nineteen out of twenty vehicles through the lines, now each and every cargo was subjected to a thorough search, creating an instant nightmare for millions of legal commuters and commercial traders. -- You value our cordial relations with Mexico as an essential element of our foreign policy. -- The excellent relations between our countries rest on mutual respect for each other's sovereignty, as well as on our mutual interests. -- You share President Díaz Ordaz' desire to maintain close personal relations, as your predecessors did. -- You intend to consult with him from time to time on matters of mutual interest. [We] hope that our enforcement officials can continue to work together closely." Just days before Operation Intercept went into effect on September 21, the United States finally alerted Mexico to the planned crackdown when Ambassador Robert McBride met first with Foreign Secretary Antonio Carrillo Flores and then Interior Secretary Luis Echeverría to discuss what was about to happen. Although McBride carefully explained the task force findings, the significance of the drug problem to the new Nixon administration and the outlines of the imminent action, he left the meetings worried that the officials did not fully grasp the difficulties the crackdown might cause. Mexico reacted with shock and horror when Operation Intercept was implemented. A flurry of phone calls and hastily called meetings ensued, with the Mexicans increasingly agitated over what they felt was a betrayal of an implicit understanding between the two nations to consult and cooperate with each other on matters of bilateral significance. As tempers frayed and the lines at the border grew longer, Carrillo Flores took the unusual step of writing a personal letter to Nixon in late September. Carrillo urged the president to correct the "excesses" of an action that had been "negligible in stopping the traffic of marihuana and drugs, but great in harming the economy on both sides of the border and in creating frictions and bad publicity for the United States." "[I realize,"] Carrillo continued, ["that it is] totally unorthodox to address you. I will never do it again. But in this case I am convinced you have the opportunity of doing something for which all Mexicans will be grateful. (They simply can not understand that two weeks after you met with our President, the most drastic, and for many, unfriendly measure against Mexico was taken.)" Not all U.S. agencies supported the tactics of Operation Intercept. Driven by Nixon's focus on crime, it was designed and executed by senior officials from key U.S. law enforcement agencies such as Justice and Treasury. The State Department - which represented the interests of diplomacy with Mexico - was essentially cut out of the process. Throughout the crackdown, the U.S. embassy in Mexico sharply opposed the policy, as the ambassador wrestled with breaking the news to the Mexicans and then managing their response. McBride warned of "catastrophic consequences" for relations between the countries, and at one point tried to convince administration officials to cancel the plan altogether. Leaks in early September about U.S. intent, he claimed, "have obviously alerted [the drug traffickers to the] need for caution in their nefarious operations, and doubtless those involved have taken precautions to ride out the storm. While I am aware of enormity of problem, I wonder if Operation Intercept in its present marred condition is really worth risking serious difficulties with Mexicans." Another dissenting agency was the Bureau of the Budget - predecessor to the Office of Management and Budget, which assists in the preparation of the federal budget and monitors government spending. On September 29, as Week Two of the border crackdown was underway, the agency sent a scathing critique to the White House of the June report that had served as the catalyst for Operation Intercept, calling it a "grossly inadequate basis for Presidential decision" and warning that its recommendations were based on faulty or unproven assertions. The report asked the President to focus his policy on the fight against marihuana rather than hard drugs such as heroin or LSD, despite studies showing that resources aimed at hard drugs were "about 100 times as effective as equal resources used against marihuana." The report sought to punish Mexico for growing a crop - marihuana - that represented some 9 percent of its total exports, and offered individual farmers up to 40 times the income that any legitimate crop might provide. "The Government of Mexico may be most reluctant to commit itself to a program with such a potential for social unrest." The report did not address the potential political backlash from U.S. border communities. The policy had a "high risk of making the Administration appear inept by playing into the hands of organized crime and creating more hard drug addicts." (Emphasis in original.) As marihuana becomes scare, the Budget Bureau argued, harder drugs would be used as substitutes. "Even more seriously, the hard drugs lend themselves to manufacture and/or distribution by organized crime syndicates. It seems probable that the Mafia would be a strong supporter of a diversion of Federal resources to marihuana as opposed to hard drugs." Mexican objections eventually had the desired effect. By mid-October Intercept was called off, replaced by a new anti-drug agreement between Mexico and the United States called "Operation Cooperation," in which both countries collaborated on designing a shared strategy to reduce the production of narcotics inside Mexico and its movement across the border. Operation Intercept served United States interests in several ways. It was the fulfillment of a campaign promise by a new Republican president to show that he could be tough on lawlessness, and thus earned Nixon domestic political points in his first year of office. It served as the opening shot in what would rapidly become a global war on drugs-a war that would far outlast the Nixon White House and would occupy successive administrations for decades to come. And finally, it was an exercise in the politics of coercion, whereby Washington used economic and political blackmail to pressure Mexico into moving on an issue that mattered to the United States. In the end, the crisis did push Mexico into committing more resources to a concerted drug eradication and enforcement policy, and led to Operation Condor in the 1970s, which included a defoliation campaign using the toxic "Paraquat" herbicide. But whatever the intended outcome was, Intercept also led to a series of unintended consequences that undermined the lessons the U.S. longed to teach Mexico. Combined with effects of the global war on drugs during the Nixon administration, Mexico's attack on marihuana growers and the end of the opium trade in Turkey resulted in a new and hungry heroin market in the United States, which incipient Mexican crime organizations were only too happy to fulfill. The introduction of Colombian cocaine in the mid-1970s helped transform Mexico's traffickers into a powerful mafia that could afford sophisticated technology to protect its interests, and the enormous drug profits that ensued threatened to destroy Mexican law enforcement with new levels of corruption. Could Operation Intercept happen today? It might: in the name of counterterrorism, the new department of Homeland Security has the authority and the capability to close the border down. And clearly, Washington's penchant for unilateral action is as strong as ever. But U.S.-Mexico relations have changed dramatically since 1969, and the concept of "interdependence" has taken on a whole new meaning. Back then far fewer Mexicans were living and working in the United States. And the cross-border economy was a trickle compared to the quarter of a trillion dollars in annual cross border trade today. The United States could close the border for a few hours, even a few days, but the damage it would inflict on itself by unilaterally shutting it in the name of national security would become crippling after that. Mexico knows it must act as a true partner to the United States in this time of war and heightened security, and it already has - by sending 18,000 military troops to the border crossings, airports, bridges, ports and key energy facilities linked to the United States. Perhaps the first lesson of Intercept is that pragmatism, not personalismo, must guide bilateral relations. Whether the two presidents are shaking hands in front of the Amistad Dam or comparing boots in Guanajuato, the myth of the "special relationship" has been carefully nurtured for many decades. It needs to be discarded. Photo ops are never a good substitute for the (admittedly difficult) crafting of mutually acceptable bilateral policies, and policies are not favors to be handed out to an old friend; they are tools to serve national interests. Finally, Nixon launched Operation Intercept because he could. Today, any attempt by the United States to punish or castigate Mexico that resulted in real harm to the Mexican economy would automatically lead to collateral damage to the U.S. economy in turn. Viewed in that light, the fears expressed in countless editorial and opinion pieces in the Mexican press as Fox equivocated over how to vote in the United Nations on the war in Iraq were anachronistic, out of synch with the realities of U.S.-Mexican interdependence today. The real lessons of Intercept are that no nation, not even the United States, can shut its doors to valuable legal trade and travel. What Henry Kissinger wrote back in 1969 - that relations between the United States and Mexico should be based on "mutual interests" - may not have been true back then, but it is closer to the truth today. After a speech in Anaheim, CA on September 16, 1968 (coincidentally Mexico's Independence Day) in which President Nixon pledges to "move against the source of drugs," the Special Presidential Task Force on Narcotics, Marihuana and Dangerous Drugs is created. Six months after Nixon takes office, the Task Force delivers its report to the President, providing the analysis that would spawn "Operation Intercept." The report focuses almost entirely on marijuana and gives special attention to the smuggling of the drug from Mexico into the United States, recommending better profiling of drug runners and the improvement of detection technology. The report also recommends asserting economic pressure on Mexico by making Tijuana off limits to American military personnel. "Although a relatively small percentage of the military element is involved in the smuggling of narcotics, the social and commercial atmosphere produced by the drug trade in Tijuana greatly affects their activities. Should Tijuana be placed off limits to all military personnel, the action could be considered as an inducement for better drug control along the border." Finally, the report signals a new era in which the War on Drugs is elevated to "the highest rank of those matters affecting the vital interests of the nation." Shortly after the completion of the Narcotics Task Force's report, White House senior advisor John Ehrlichman forwards it and a summary of its recommendations to President Nixon. In his memo to the President, Ehrlichman eschews the more diplomatic language of the actual report and cuts straight to the point: "The task force recommends that the Mexican government be forced into a program of defoliation of the marijuana plants (using borrowed or leased equipment from the United States) by commencing a campaign of strict enforcement and customs inspection at the border." As June comes to a close, President Nixon sets the recommendations of the narcotics report in motion, ordering the creation of a new "Action Task Force" which will take "immediate steps calculated to make a frontal attack on the narcotic, marihuana and dangerous drug traffic across the Mexican border." The President here describes the general profile of the new outfit as well as strict guidelines for its activities. "The work of the task force shall be confidential and any and all publicity with respect to its work and accomplishments shall be released only by the White House." In the weeks leading up to Operation Intercept, U.S. officials would provide the Mexican Government with a number of vague hints as to the Action Task Force's plans. In late July U.S. Ambassador Robert McBride presents President Gustavo Díaz Ordaz with perhaps the first of these tips, informing the Mexican leader that "highest level of U.S. Government was deeply concerned about problems of narcotics traffic entry into United States from Mexico." Díaz Ordaz appears to suspect nothing out of the ordinary, responding that he is also very concerned about the problem and "would be glad to have Mexican delegation continue to discuss this subject at high levels with [the U.S.]." and to reassure him that we will consult with Mexico before firm decisions are taken in matters which affect Mexico." "President Nixon Trip to Mexico Sept 8, 1969 Briefing Book"
As the start date for Intercept grows near, Ambassador McBride reports that several important leaks to the press have greatly reduced the chances that the operation can yield enough drug interdiction success to merit what will likely be significant damage to U.S. relations with Mexico. "Leaks from U.S. Navy (which have indicated date of operation) and through New York Times have obviously alerted everyone to need for caution in their nefarious operations, and doubtless those involved have taken precautions to ride out storm. While I am aware of enormity of problem, I wonder if Operation Intercept in its present marred condition is really worth risking serious difficulties with the Mexicans." Just three days prior to the inauguration of Operation Intercept, Ambassador McBride briefs Mexican Secretary of the Interior Luis Echeverría Alvarez on the details of the plan. According to McBride, Echeverría's response was fairly "non-committal" and expressed no "exception or reservations" about the plan. However, the U.S. Ambassador recommends caution in interpreting this response. "Although he expressed no concern about Operation Intercept at this particular meeting I think it may be that he did not grasp fully the inconveniences and difficulties that it may cause." On the eve of Intercept and with notable dismay, Ambassador McBride reports that every possible effort has been made to convey to the Mexican Government the seriousness of the impending operation. Despite these efforts, according to McBride, Intercept will likely have disastrous results for U.S.-Mexican relations. "When this operation is put fully into effect, it may well have catastrophic consequences in terms of our relations with Mexico but I would like to make it absolutely clear that there is nothing further we can do here to cushion the impact." About a week after the start of Intercept, the Budget Bureau furnishes an extremely critical evaluation of the operation and the policy recommendations that led to it. The Bureau blames the Presidential Task Force for providing the President with "no policy options, no pro's and con's, and no cost estimates." Specifically, the memo argues that the potential damage to U.S.-Mexican relations was never properly assessed, nor was the negative economic impact this operation would have on the U.S. side of the border where business has been depressed by "50-90 percent". Finally the Bureau scathingly critiques the Task Force's failure to assess potential negative consequences for the drug fight itself. By focusing on marijuana, the report argues, the operation could have the effect of moving users off "soft" drugs and on to "hard" substances like heroin, while boosting the mafia elements that traffic in those harder drugs. As internal pressures mount on the Mexican Government to respond to the border situation, Foreign Secretary Carillo Flores takes the unorthodox step of writing a letter directly to President Nixon and pleading for the American leader to correct Operation Intercept's "excesses". 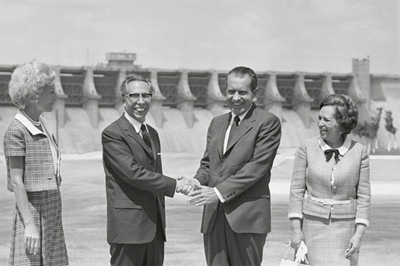 By eschewing normal diplomatic protocol and writing directly to Nixon, Carillo Flores emphasizes his government's urgent desire to find a solution to the situation. In the process he argues that Operation Intercept's "results have been negligible in stopping the traffic of marihuana and drugs, but great in harming the economy of both sides [of] the border and in creating frictions and bad publicity for the United States." Dear Mr. President: Yesterday I talked at length with Secretary Rogers about "Operation Intercept," and how, according to all the information we have, its results have been negligible in stopping the traffic of marihuana and drugs, but great in harming the economy on both sides [of] the border and in creating frictions and bad publicity for the United States. I hope it will be possible for you (as our Ambassador has already asked for to the State Department) to review that operation and to order its excesses be corrected. P.S. Secretary Rogers was extremely attentive and sympathetic. But naturally the authority is yours. provoked strong hostility," which State attributes to "a feeling of wounded dignity on the part of the Mexicans inspired by the intense personal search they are subjected to. Mexican sensitivity about their dignity, their suspicion that at heart Americans regard them as inferior beings, causes them to react at a high emotional pitch." Responding to the personal note from Carillo Flores to Nixon, National Security Advisor Henry Kissinger delivers the letter to the President along with a response for him to sign. In the cover memorandum Kissinger notes that the Mexican Foreign Minister's "unusual step" of writing directly to Nixon "does, in fact, underline the intensity of the Mexican feeling about Operation Intercept." Concluding that the situation is "becoming a serious problem" for the bilateral relationship, Kissinger explains that the response to Carillo Flores "is a longer and warmer letter than might normally be sent to a Foreign Minister, but I think the occasion calls for it." Following Kissinger's recommendation, Nixon signs off on the "warm" response to Carillo Flores, expressing both his continued concern over the drug issue and the willingness of the U.S. Government to meet with the Mexicans on the issue. "I am sure that the bilateral talks which will be held will be able to find ways to achieve the objectives of Operation Intercept with minimum disruption of this kind." On the same day he signs off on a letter to Mexico's Foreign Minister on the Intercept situation, Nixon indicates to his senior advisor, John Ehrlichman, that the objectives of the operation have been accomplished. "It would appear that this is the time to negotiate since we have proved our point pretty effectively." One week before formal bilateral negotiations on the newly named "Operation Cooperation" begin, Ambassador McBride offers his prognosis for their success or failure. Noting the desire of both sides to stem the drug traffic while maintaining "a cordial and indeed special relationship," McBride sees much potential for a successful outcome. However he also emphasizes that a negative result could hold "disagreeable consequences for U.S. in other countries not to mention a collapse of our relationships in this key country of the hemisphere which is so closely watched by other countries to see if U.S. protestations of good fellowship can be taken seriously." Following the agreement of October 10 to change the name of Operation Intercept to "Operation Cooperation," official bilateral talks are held in Mexico City on October 27 and 29. As a result of these talks, "delays, irritations and inconveniences at the border and at other ports of entry had been reduced to virtually pre-Operation Intercept levels." In concert with this action, it was agreed to create a "joint working group" to identify "possible bases for agreement between the two Governments and to report their findings to the two Governments." In addition, Mexico reaffirmed that "in accordance with Mexican national policy and the provisions of the Mexican Constitution, its Government's efforts to continue intensifying the fight against the illegal traffic of narcotics would continue to be carried out exclusively by Mexican personnel under Mexican direction." After signing the "Joint Communiqué" in late October, Mexican and U.S. officials meet for weeks in Mexico City to agree on the specific outlines of a cooperative effort to reduce drug production, drug trafficking and drug abuse. Having reached agreement on the design of the new counternarcotics program, however, the Mexican delegation suddenly balks at signing the final report - a decision sparked by an inaccurate article in the Mexican press claiming that Operation Intercept will become permanent U.S. policy. Ambassador McBride cables the bad news to Washington and describes it as the product of residual resentment in Mexico over the way Intercept was carried out. "In last minute eruption of their still smoldering bitterness about Operation Intercept and absolute unwillingness to do anything under pressure, real or imagined, from U.S., Mexicans today refused to sign joint working group (JWG) report due December 15." The Mexicans ultimately reverse their position, and the report is signed and published on December 12. In early January the State Department's annual Country Analysis and Strategy Paper (CASP) on Mexico is finally delivered, though somewhat behind schedule. The report, which was delayed after the Intercept crisis forced some revisions to the original text, emphasizes the importance of Mexico to the United States based on a long common border and the fact that "Mexico's ability to maintain reasonable political stability and a broad compatibility with U.S. aims and institutions is essential to U.S. security." The report notes the need to understand how "domestic political realities and strong nationalist sentiment" in Mexico can turn seemingly ordinary "new interventions" like Operation Intercept into political crises. Citing billions of dollars in exports to and investments in Mexico by the U.S., the document also emphasizes the great interdependency of the two countries, noting that such high levels of economic exchange are unique in U.S. relations with the Third World. "In this sense we should regard Mexico as a special case in our relations with the developing countries in that success or failure of the country's short and longer-term development policies can directly affect important U.S. economic as well as security interests. By the same token, the reverse is true; Mexico depends on the United States for trade, tourism and capital which are vital to its economic development."